Behind the Lace Curtains-Friday Fun Day, TV Shows, The Dukes! 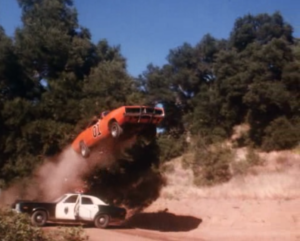 My brothers and I loved the Dukes of Hazzard. We looked forward to every Friday evening to watch how Bo and Luke and Uncle Jesse and Daisy were going to ruin Boss Hogg’s and Roscoe’s plans of whatever nefarious activity they were up to. If we were good that week, Mom would bring home a large House Special Nalivka’s pizza and we each got our own bottle of Coca-Cola-not sharing, we got our own for that day only! Those were great times bonding with my brothers and that will always be a fond memory for me!